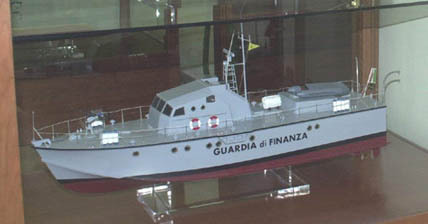 Does anyone know the identity of the Italian Patrol Boat 'GENNA' (G 68) ? All I know is she was one of the 'Darks'. From the PTF Nasty website, Alan Vincent confirms his company bought no less than 11 of the 18 Darks from the RN and scrapped the Deltics, replacing them with GM 6-71s for the deliveries to Livorno and La Spezia in 1967 subsequent to purchase by the Italian Govt (they were subsequently re-engined with CRM 18 cyl diesels). She could be any of them, all I know is that Gladiator, Hero and Scout were not among them. p.s. yes please pic to when you get a chance. Pic on it's way Christian. According to Jane's 1970-71 - in Feb 1967 - Dark Avenger-'Biter -'Hunter -'Invader were sold to Italy and used by the 'Guardia di Finanza' - Jane's is not infallible and Conway's All the World's Ships 1947-95 does not mention this Italian Marine Arm - while Lt Cdr Ben Warlow states (Minor War Vessels in Focus) that Dark Rover (ex Dark Cavalier?) was transfered to the Italian Customs in 1966.
thanks for the info. Interestingly, have a photo of Biter & Antagonist in Genoa prior to conversion. Pic is dated 12th October 1967. There are 4 ships lined up and photographed from either end, so cannot tell which ones the middle two are. Are there any photo's out there of them after conversion ? Might be able to compare them to the one I have. She may be the Customs version and not one of the GDF ones. I'm just a little confused - I thought the GDF was the Italian Custom's -no? and if you count up Christian's 11 being bought off the RN by Alan Vincent 'Hero 'Gladiator and 'Scout not being one of them - where did the extra boat come from? Sorry Ted. I got a bit confused with your mention of a 1966 date for Dark Rover. I thought they all transferred in 1967 ? Didn't read your Italian properly either. 'Finance Police' = Customs. Oops !! Antagonist + 3 in Genoa. October 1967. It certainly matches the pic I sent you Christian.